I have always enjoyed playing Yamaha acoustic & digital pianos but I like playing and owning other brands as well including Kawai, Roland, Steinway, Korg, and a few others, so my studio and professional piano playing life is not limited to one brand. Each good brand offers things the others don't so that's why I use and play multiple brands and models. With regard to the entry level P45 portable digital piano, it has 88 piano style simulated graded weighted key action along with a 64-note polyphonic stereo acoustic piano sound. For beginners through intermediate players, 64-note polyphony usually is usually more than enough note processing power to play most music. Other digital low priced portable digital pianos have even more polyphony processing power including the Yamaha P115 at 192-note polyphony, Casio PX160 ($499US internet discount price) at 128-note polyphony power, Kawai ES110 ($699US discount internet price) at 192-note polyphony, and the new Roland FP30 at 128-note polyphony. The polyphony number isn't everything that goes into note processing and memory as Roland polyphony at 128 notes of power is actually more powerful in some ways than pianos with 192 notes or more. As compared to the other digital pianos like the Casio PX160 at 128-notes of polyphony, the P45 has 50% less polyphony processing power for sustaining stereo piano notes or layering two sounds while playing multiple notes, but it's also less money at $449, so you do get what you pay for. But as I said, 64-note polyphony is usually fine for many entry level students and even intermediate players. The P45, like the P115, both have Yamaha's entry level GHS key action which is a 2-sensor (per key) key action with white plastic feel key tops (no simulated ivory feel like some other portable pianos in a similar price range) although the black keys have a smooth mat satin feel and are nice to the touch. However the keys still feel good to the touch. The action itself is a bit less realistic in its weight and movement (in my opinion) as compared to some other brands including the higher priced Yamaha GH key action. To me, the lower priced Casio PX160 ($499US internet discount price) has a bit more realistic and expressive key action along with having 3 key sensors per key for more accurate note repetition. The GHS key action has been out for many years and is the standard key action which Yamaha currently uses in all of their low priced digital pianos under $1000. I did notice that the keys in the GHS (graded hammer standard) key action in these two newer models were less noisy and plastic sounding going up & down than in previous model GHS key actions, so perhaps Yamaha has improved the GHS mechanisms a bit in this way and if so, this is a good thing and I noticed it. Overall there is no doubt that the Yamaha GHS key action movement is more than satisfactory for people who want to be in this lower price range and the key action is much, much better than any of the off brands or lesser known brands including Williams, Korg, Suzuki, Artesia, and a few others. 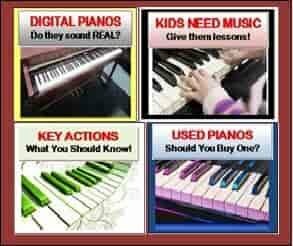 The key action is the number one thing you need to get "right" when shopping for and buying a new digital piano so make sure you do it right the first time because you'll regret it if you don't. As for piano sound reproduction and how authentic the acoustic piano sound is, both pianos use a sampling process to capture sound but the P45 uses an older process called AWM and the P115 uses a newer and better process known as Pure CF. There is a noticeable difference in piano sound authenticity between the P45 and P115 in this way so the P115 does have a distinct advantage there although the P45 does sound good for it's low price. Also, as I mentioned earlier the P115 has triple the polyphony processing power at 192 notes maximum (better for playing more complex music and layering 2 or more tones together) so this additional technology does make the P115 a better choice as well. However, there is also something called "dynamic range" of sound which is part of what makes one instrument more expressive than another one. Dynamic range includes how much volume range there is when playing a key softly and then playing it hard with force as well as tonal range from mellow to bright when playing the keys. With regard to both the P45 and P115, the overall dynamic range is good but not nearly as realistic as an actual acoustic piano sound. When I play these pianos the piano sound is more compressed, especially when playing louder (fortissimo) and therefore less expressive in its dynamic range based on what I am used to playing in acoustic pianos and other name brand digital pianos. A beginner or intermediate player may not notice this situation, but I definitely did. This lack of full dynamic playing range is likely not going to be a hindrance or issue for a lot of people purchasing in this price range but I like as much tonal and volume expression and tonal colors as I can get because that is what playing music is all about...expressing yourself as much as possible, and for these reasons I might not personally buy a P45 or P115 if I had a choice of getting something else that gave me more tonal & key volume expression along with the features I like, but that might also cost me more money, so it's relative to how much you want to invest. 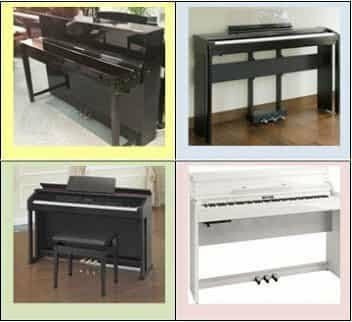 But for many other people looking for a piano playing experience, based on price range these two models might be the perfect options. Other fundamental features on these two pianos is that they can both layer 2 sounds together simultaneously, both have 3 touch sensitivity levels, both have 4 reverb effects to choose from to add a bit of liveliness to the sound, both have a feature called Duo which allows two people (student/teacher, siblings, etc) to play on the piano at the same time by splitting the 88 keys electronically into two identical octave 44-note keyboards, both have a digital metronome which helps with timing although the P115 metronome can be set to go slower than the P45 which is a good thing, they can both transpose the key an octave up or down electronically, and both have USB output to device (computer, iPad, etc). So there are a number of similarities between the two models. However the P115 does allow for splitting the keyboard into two different sound parts so that you can play a different instrument sound on the left hand (example:bass) and a different sound on the right hand (example: jazz organ). This is fun to do although you would likely need to be a bit more advanced in your playing skills to really take advantage of it. The P45 cannot do this. However, there are a number of differences which makes the P115 for another $150 a better buy and investment and totally worth the difference in price in my opinion. One of the biggest things other than what I previously mentioned about the P115 have triple the polyphony processing power and a better piano sound sample, is the fact that the P115 has an upgraded built-in internal sound system. Even though the speaker system specs show the P45 at 12 watts total power and the P115 at 14 watts total power, the actual real difference is big because the P115 has 4 speakers (top and back facing) in it instead of just 2 in the P45 and the P115 uses special sound circuitry called "sound boost and "intelligent acoustic control" which adds to the sound fullness and bass response of the P115 along with being positioned in the piano cabinet differently. The P45 maximum volume sounds weak to me as compared to the P115 and I happen to like some good full internal volume. If you want to output the P115 to an external speaker system the P115 offers two 1/4" audio line out jacks to easily do this. This is something lacking on a few other digital pianos in the low price range so if connecting to external speakers is important to you then the P115 would be the obvious choice because the P45 cannot do this. Also, if you want to shut off the internal speakers on the P115 but have the sound outputted to an external speaker system, the P115 allows for this to happen with an internal speaker on/off function. All I can say is that because of the better piano sound chip, polyphony and speaker system of the P115, it sounds and functions 100% better than the P45 and these things alone is a good reason to spend a bit more money on the P115. As for the control panel and instrument sounds on these two pianos, on the P45 there is just one button to select 1 piano sound. However there are 10 instrument sounds total including 2 acoustic pianos, 2 electric pianos, 2 pipe organs, 1 string symphony, 2 harpsichords, and 1 vibraphone. To access these additional sounds on the P45 you would need to press and hold the piano button which acts as a function button when holding it and then you would press specific white or black keys on the keyboard for the instrument sound that you want. 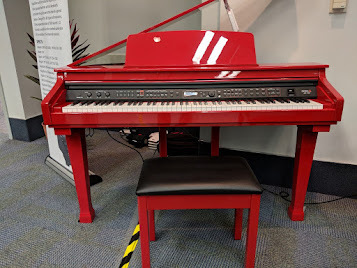 This process is also used for accessing all other functions in the P45, although other portable digital pianos use this "hold function while pressing key" system including the P115. The difference between the P45 and P115 on the control panel is the P115 has 14 total instrument sounds including 3 acoustic pianos, 3 electric pianos, 1 pipe organ, 1 jazz organ, 1 rock organ, 1 string symphony, 1 harpsichord, and 2 basses and all sounds have control panel buttons for direct quick access rather than holding a function button and pressing a certain key for the sound. Therefore the P115 is much more user friendly and intuitive. Also the P115 has the better and improved sound library as opposed to the P45. Also the P115 has 14 drum rhythm patterns and 10 pianist accompaniment styles which are great for rhythm, timing, and just having musical fun, and can be accessed from control panel buttons as well as the P115 recording function accessed from a control panel button. There are other functions on the P115 which need to be accessed like the P45 system, but at least the P115 has the main things it does being controlled by panel buttons. At this point I am thinking "why would anyone want a P45 when for another $150 bucks they could have a vastly superior P115!? Yes, I know that some people are on a tight budget so the extra $150 to get a P115 may be a stretch for some people, but the P115 is sooo much better it would be unfortunate not to invest in the long term by getting the P115 which offers so much more in nearly every way and is a very nice product by Yamaha. Yes the P45 is nice too and they both have the same key action which is good but not great. As I mentioned much earlier in this review, the lack of a wide and more natural dynamic range of tone and volume when playing from soft to hard on the keys is a bit of a disappointment for me as I have higher expectations, but I could learn to live with it if I had too, and for $449 and $599 respectively, both Yamaha models are reliable instruments and should last for many years without problems and you should enjoy either one. Both models are very light to carry weighing in at approximately 26 lbs each and both instruments come with a music rack to support books or sheet music. Also the P115 comes in a choice of satin black or satin white whereas the P45 is only available in satin black finish. I think whichever one you choose will be a good choice although there are other good portable digital pianos options out in the market that I like very much and one (the Casio PX160) is $100 less money than the P115 and the other two are just $100 more money than the P115 including the new Kawai ES110 and the Roland FP30. In fact, the Kawai ES110 has a noticeably more authentic piano sound, key action, and pedaling than any of these other portable digital pianos I mentioned including the Yamaha's. It's really pretty amazing and Kawai uses a new individual key sampling and key action system that adds more organic realism to the piano playing experience than I have ever heard from a portable digital piano in this price range. If you don't know much about the Kawai company or have not had experience with this new ES110 model, I would recommend you read my review of itl before you make any purchase decisions...you'll be glad you did:). 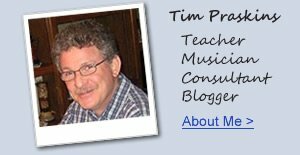 Please read all my reviews of the Kawai, Roland, and Casio models to get more info and then contact me for specific free advice and even lower prices. 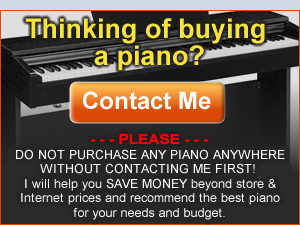 I've been looking for a digital piano and have read a lot of reviews. I have narrowed down my options between Casio Privia PX350 and Yamaha P115. AS a beginner, I don't need a lot of bells and whistles but its good to have. but they say, Yamaha P115 has better sound quality. what do you think? Thanks in advance. You might also try the Casio PX160, Kawai ES100, and the new Roland FP30. I especially enjoy the new Roland FP30 and also the Kawai. I purchased the three-pedal unit without the stand for my P115, for one very important reason - the Leslie-effect for the jazz and rock organs! Just plug it into the back - it's the 9-pin plug. The middle peddle sustains the organ notes, and the left one actuates (or de-actuates) the Leslie when pressed on. Without the proper fitting in the stand, it's a bit unwieldy - you need to tack it to the floor with velcro or something, and practice makes perfect re: acoustics and use. But for $100 more, you get plenty more to work with than an FP-4 pedal or whatever! Thanks for your realy helpful reviews! Imagine korg sp-280, yamaha p-115 and p-45, and korg B1 are all almost in the same price range.